Air transporters applied on moving and handling works on industry areas, capacity from 10T to 48T, more or less capacity can be customized as demand. Air transporters also know as air casters machine handling equipment, air powered material handling machines, air bearings casters. 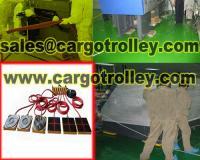 Air casters machine handling equipment is one of the perfect heavy load moving equipment. Air powered material handling equipment are a great way to move the heavy loads. Shan Dong Finer Lifting Tools co.,LTD produce air transporters complete systems with remote control. Air powered material handling equipment are quick, clean and effortless using a little shop air for power. Air casters allow for the safe movement of your materials. Air Skids, containing the air caster element, and placed under a load can be used to move almost anything. Air casters and air bearings is the first choice in heavy load moving systems and equipment. Air transporters are moving tools which move heavy machinery equipment on air. Air powered material handling equipment is cost effective, is great for clean rooms, and anyone can use with no special training is workable. Air bearings casters is particularly where greater ease and more efficient productivity is desired. Regarding air transporters structure,air casters machine handling equipment price list, air powered material handling equipment applications, air rigging systems manual instruction, please kindly feel free contact with us. Professionally service hope will get your satisfaction. Our company is specialized exporter, manufacturer and supplier of Air casters machine handling equipment in China.